There are times that we get so angry, that it seems impossible to keep it in. Some people let anything make them mad, whether it is big or little. Other people let little things add up until they finally explode and let their anger get the best of them. Either way, when people are angry, it is usually obvious. Body language, such as clenched jaws or fists, intense glares, or red faces, shows others when a person is angry. This is often followed by verbal insults and heated rants. People tend to say a lot of things that they regret when they are angry, and sometimes even upset or hurt others in the process. Such fits and rants usually do not end up being very constructive. 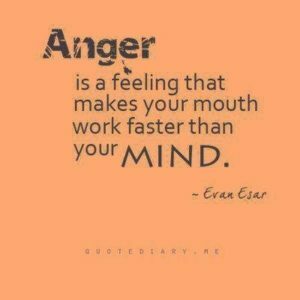 There are better ways to go about our anger. This passage is packed with important points. The first is that we should strive to not sin in our anger. We should always strive not to sin, but it becomes more difficult when our emotions get the best of us. So, it is important to focus a little harder in those times. The next point is that we should not go to bed angry. If you are like me, you tend to identify with the saying “Don’t go to bed angry, stay up and plot your revenge.” However, this passage is not encouraging that. We are to make amends in whatever has upset us before time passes and it is either too late or we become angrier. Otherwise, if we do not do these things, we are giving the devil a foothold on us, which can lead us down a slippery slope. The most important part is to not let any unwholesome talk leave our mouths. While this is hard to do, it will protect us and our relationships. There is a quote about meditation that reads, “Never say mean words out of anger. Your anger will pass. But your mean words can scar a person for life.” The actions that we take while in a momentary state of anger can leave lasting hurt on others. This is why waiting to speak what is helpful; it not only saves ourselves from further hurt but it protects our relationship with others as well. This is not an easy thing to do. It is not just a decision you make, but it takes training and patience. In Psalm 141, David is asking God for help. In verse 3 he says, “Set a guard over my mouth, Lord; keep watch over the door of my lips.” This is a great prayer for patience. We cannot do this alone, but with the help of God, we can strive to live a life without anger — one that advocates productivity, peace, and at times, silence. 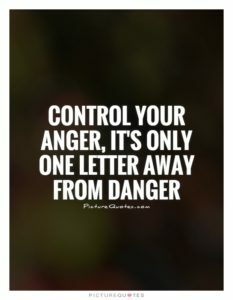 A short lesson on some of the benefits of controlling your anger brought to you by Angry Birds. Megan, thank you for this important, biblically based message.